The two Christmas offerings at Portland Center Stage were well attended. The four interpreter team did an awesome job with "A Midsummer Night's Dream" for two performances on December 6th. At the matinee, about one-third of the main floor audience were Deaf students and staff. It was a wonderful experience to be there with all of that energy. Katie O and I did a workshop with a group of students before the matinee. It was fun to see them warm up and get into the acting spirit and I expect at least a couple of them will make stage appearances in the future! The play was followed by an interpreted Talk Back with some of the actors from the play, which also proved to be insightful. And delightful. The class which stayed for the Q&A also had a couple of future actors and, I think, even a stage crew member, perhaps a director or stage manager. I really enjoy being around their enthusiasm and excitement. It is infectious. And it gives me hope for the future to see so many K-12 students attending and loving theater. David Sedaris' "Santaland Diaries" was sold out, with a large interpreted audience section. The interpreter was a great match for this year's Crumpet the Elf and I appreciate her taking on that challenging play. The plays are still running at Portland Center Stage, but the interpreted performances are done for 2012. I, however, am taking my family to see "Santaland Diaries" in a week. Yes, I've already seen it three times (twice for my own preparation purposes, since I was the understudy in case the interpreter was unable to be there that night; and then I was there for the interpreted performance). But I am up to seeing it again, and especially with my partner and Dexter, who I think will really enjoy this rendition of the play. In January, the first interpreted play at Profile Theatre for the season will be at 7:30 p.m. on Thursday, January 17, 2013. 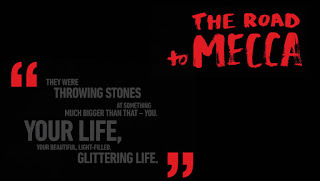 The play is "The Road to Mecca" by Athol Fugard. Click on the picture below to get more information about this play and to purchase tickets. The first interpreted play of 2013 at Portland Center Stage will be "I Love to Eat" on Thursday, January 24th at 7:30 pm. 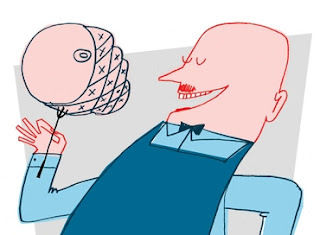 This play is about the original television chef, and a Portland talent, James Beard. Click on the picture below to go to the PCS website to read more about this play.